April: Poetry Month & Earth Day is Coming! April is National Poetry Month and we have news to share! POEM CITY, Montpelier, Vermont is one of our FAVORITE annual events…. On April 13 at 7:00 pm in the Kellogg-Hubbard Library, Leland Kinsey, Pushcart Prize nominee, will be reading from his new book Galvanized: New and Selected Poems, published by Green Writers Press in April 2016. Kinsey is also author of Winter Ready and six other books of poetry. He writes of the hard, dark life of the countryside in a haunting, spellbinding manner. 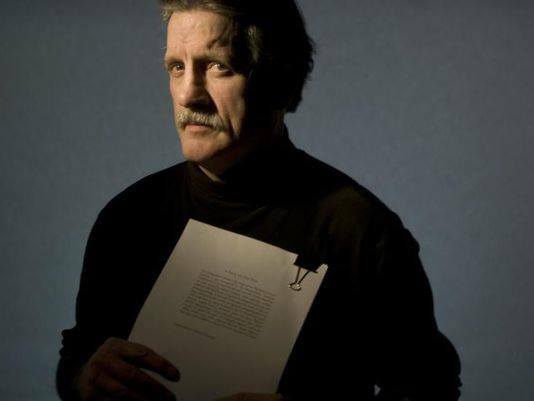 Join Kinsey for an evening of poetry at the Library. Later in the month . . .
A Round-table Discussion on Nature Poetry with GWP publisher Dede Cummings & Vermont poet Diana Whitney at the Kellogg-Hubbard Library. AND NOW ONTO EARTH DAY (BIG) NEWS! 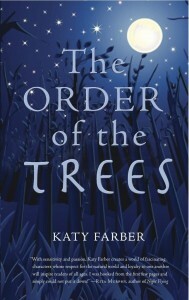 I’m super excited that The Order of the Trees is on the Nature Generation’s Green Earth Book Awards shortlist! I’m thrilled to see us—a Vermont based publisher — on this list with the major New York publishers. It is an honor to be included in this collection which features books that have a strong environmental stewardship message. 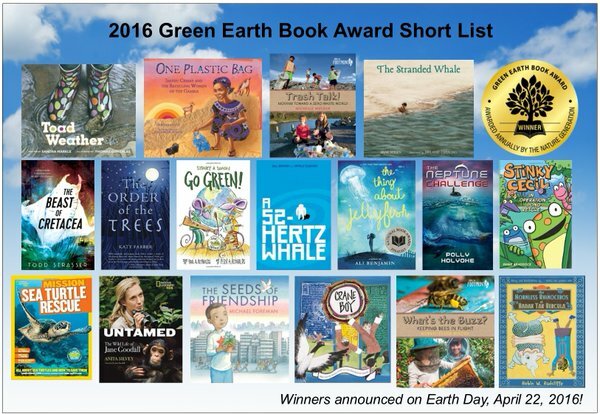 The winner and honor books will be announced on Earth Day, April 22nd 2016. Stay tuned! HERE IS A PHOTO OF THE AUTHOR—This is the kind of reading she does for kids at libraries and schools . . .
EARTH DAY IS COMING! Green Writers Press is so pleased to help promote our fantastic children’s list for Earth Day. Along with The Order of the Trees, we have another exciting children’s book series we’d like to tell you about—our 2014 title/first in the series Josie Goes Green. Green Writers Press is proud to publish the first children’s fiction book about taking action on climate change. 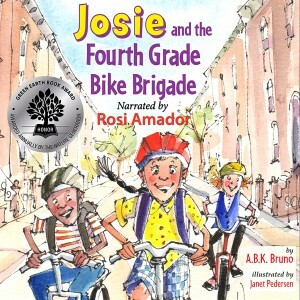 Josie and the Fourth Grade Bike Brigade is the first in a forthcoming series about Josie Garcia, a feisty nine-year-old girl from Brooklyn who becomes a crusader for preventing disastrous climate change and other environmental threats. In each book, Josie takes simple, ingenious actions that bring real changes to her neighborhood and the world. The book is for ages 7-11 and is appropriate for schools, school districts, children’s social issue book clubs, and families. Nine-year-old Josie Garcia is an ambitious girl from Brooklyn who becomes an advocate for preventing disastrous climate change and other environmental threats. 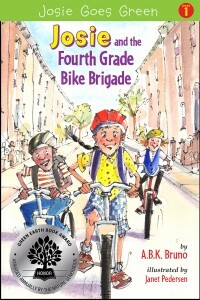 The feisty heroine in “Josie and the Fourth Grade Bike Brigade,” Josie was inspired by the children of P.S. 321 in Park Slope. Kenny Bruno; his wife Beth Handman, assistant principal of P.S. 321; and their daughter Antonia Bruno, who went to school at P.S. 321, co-wrote the new children’s book, which they refer to as children’s “cli-fi” — climate fiction. Families and book lovers of all ages are invited to “Go Green With Josie” to learn about children taking action to preserve our planet this Earth Day 2016. The book just came out as an audiobook, too, narrated by the wonderful Rosi Amador! 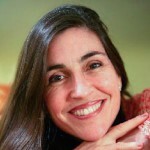 Rosi Amador, voice of Josie. Here is the website for the book. http://www.josiegoesgreen.com Josie won the Honor Book Award last year for the Green Earth Book Award sponsored by Next Generation. Thanks for helping kids feel like they CAN make a difference on Earth Day! 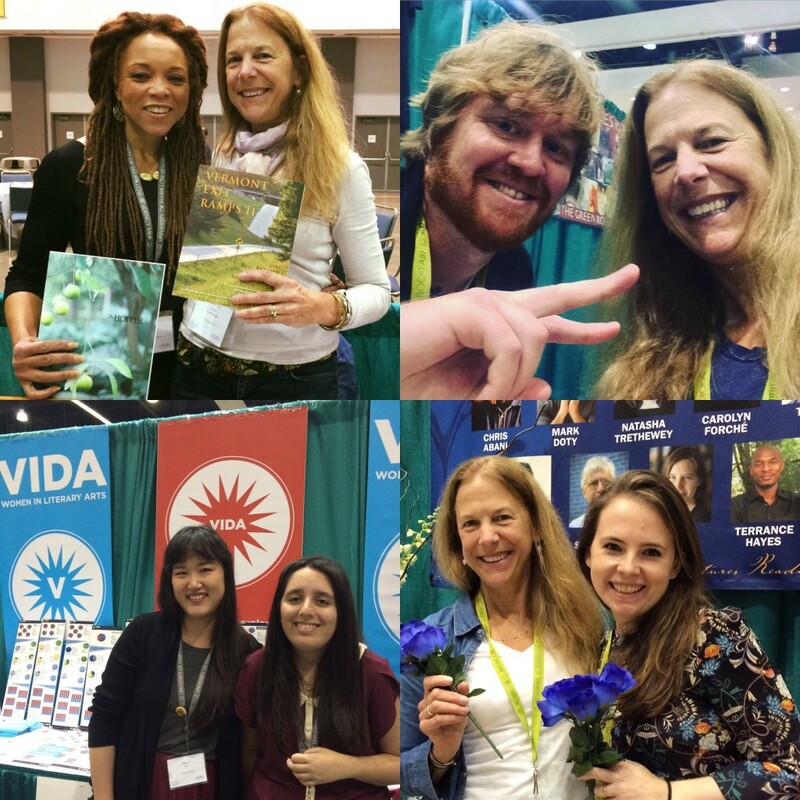 From left to right: Dede with author (and great friend) Sophronia Scott and (top right) with Tin House editor, Cheston Knapp, (bottom left) the women of VIDA, and Dede and agent Elaine Trevorrow from Blue Flower Arts in the photo below right. Next year, GWP hopes to have funding for a BOOTH! AWP—The Association of Writers and Writing Programs—had their 39th annual convention and book fair in Los Angeles at the beginning of April. Dede went out and had a GWP table. It was thrilling to be around so many writers and avid readers and here was a great deal of interest in our press! Don’t forget our two big bashes in April. 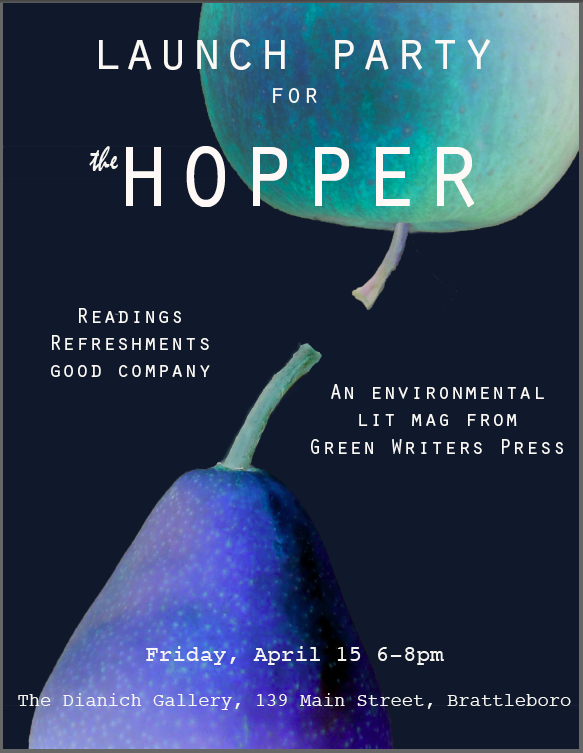 The Hopper Launch Party is April 15th from 6:00-8:00PM at the Dianich Gallery at 139 Main Street in Brattleboro. Our 2nd Annual GWP Earth Day Celebration at Next Stage Arts in Putney, Vermont, is on April 24th from 5:00-8:00 PM with readings/slides/music. 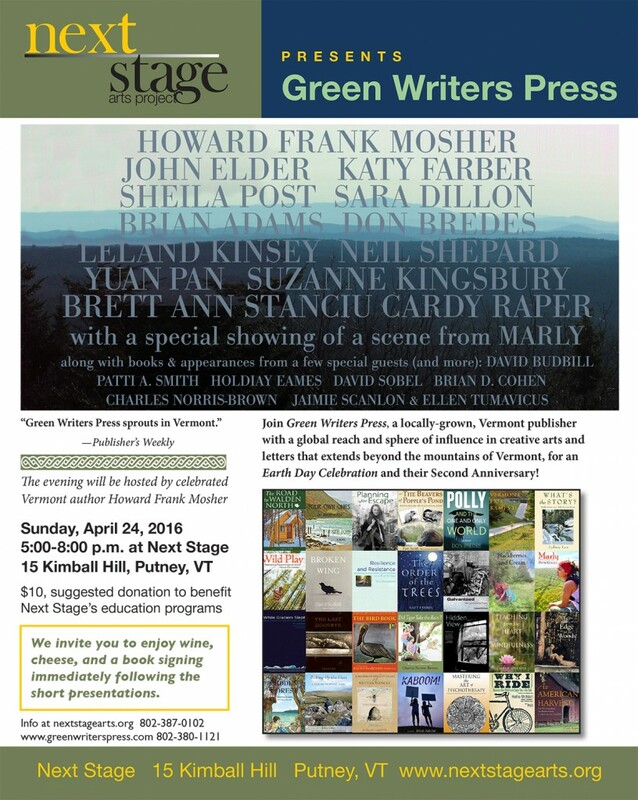 Hosted by Vermont’s celebrated writer, Howard Frank Mosher. Happy Spring (though we just got more SNOW in VERMONT! This entry was posted in Upcoming Events and tagged authors, AWP, AWP16, Blue Flower Arts, books, Brattleboro, Cheston Knapp, children, Diana Whitney, Earth Day, Elaine Trevorrow, green, Green Earth Book Award, Kellogg-Hubbard Library, Launch, Leland Kinsey, literary magazine, Montpelier, national poetry month, nature, Next Generation, Next Stage Arts, Parents, PoemCity, publishing, Putney, Sophronia Scott, tin house, vermont, VIDA_LIT, writing on April 11, 2016 by Dede Cummings.